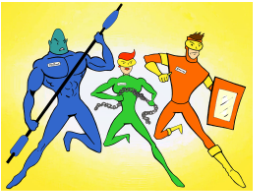 Welcome to the Heroic Adventures Page...featuring Original Superheroes and Adventures, created, drawn and presented by Scott Cranford, founder of HeroicWorld.com! "I believe a man can use 100 % of his mind... maybe even more..."
﻿Librarian Justin Wise tried to improve schools by adding morals and ethics. "The most intelligent man in the Universe". One day, in order to save a life, Sharpman used theatrics to imply that he had incredible strength. ​" Learn the Wave. Live the Wave, Love the Wave." Rowdy Highwater was the greatest and most respected surf champion in the world. 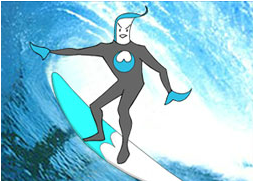 That was until the day he surfed into a mist of toxic chemicals. His body transformed into a jello like substance making him able to glide on water. ​Disqualified from the sport because of his new advantage, he became the hippest and slipperiest detective on the coast. Now everybody is trying to catch onto The Wave. "Believe your spirit free, it will be." Gloria Glancer never believed in magic. That changed after she discovered the development company she worked for was forcing a family of gypsies off their land. When Gloria tried to stop them, they took her life. Out of respect, the gypsies buried Gloria with their oldest crystal ball. Not only did the mysterious ball bring her back to life, it gave her strange and magical powers including the power of flight. Now as Platinum Gloss her new purpose is to spread a message of spiritual equality to humanity and beyond. "My will, will change this Universe." A team of extraterrestrials visiting earth left baby Tad-Eal behind. A young couple in hopes of having a child discovered the tiny alien and took him in and raised him as their own. They concealed his alien features with a mask and gloves, claiming the infant a burn victim. Growing up Adam Evans began to notice "out of this world" abilities. Wanting to fit in at school, he keeps these abilities a secret, but he knows it wont be long before he will have to use these powers to help fight an imminent attack by his own species. "You are given a bountiful haven, treat it with love and respect and that what it will give you in return!" The top scientists on Neuth, a perfectly ecological planet in a far away galaxy, have predicted an environmental doomsday for Earth. Garth Davenger is a rebellious college student living on Neuth. His father died trying to get Earth a message. Being the only Neuthling to grow up watching Earth's television, Garth goes against the Safety Council's policy of not interfering with interplanetary affairs. 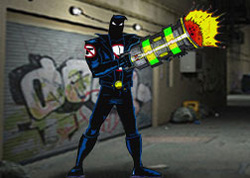 He embarks on a dangerous mission to show the people of Earth how to save their planet as, The Earth Avenger. "It doesn't matter how bright you are, ANYONE can be a hero! Max Tanner invented a tanning bed that could give you a fantastic tan in only ten minutes. He immediately became society's favorite son. Suddenly a nasty and embarrasing scandal stopped his promising career. Soon he was public enemy number one. Shamed, he tried to taking his own life by spending all day in an untested tanning bed. Instead of dying, he was given super powers! Now he is challenged to re-obtain his position in high society as Society's Sun. 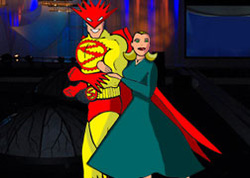 Eddie Juggles had the top-rated Juggling Television Show in the world. That was until The Daring Darrens entered the stage. 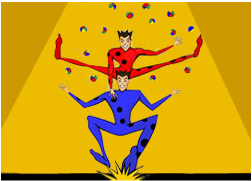 An appearance on The Eddie Juggles Show made Flip and Dash Darren juggling icons faster than a greased cannon ball shoots through whipped cream. Now, Eddie wants revenge, not only on the talented twins but also on the audience that betrayed him. The brave and bold bros must now use their supreme juggling skills to stop him!
" Never take Life for Granted." After a pathetic and wasted life of swindling from others, con-man Austin Storms was shot by ruthless gangsters. Upon receiving judgment above, Austin did not like the other option. On his way down, he stole the form of a cloud. Now he remains on earth to right the wrongs he caused during his life and guide those in need of salvation, toward righteousness as The Cloud. "The greatest protection agency in any Universe." No matter what ex-Navy Seal Johnathan Block tried, he could not get his Universal Protection Agency off the ground. Then, while on a mountain hike, he stumbled upon a crashed Neptunian spaceship. He found an enormous dying Neptunian inside. 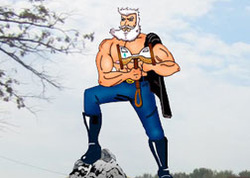 ​He nursed the giant blue alien he calls Obstruct back to health and trained him in the profession of protection. Now with his girlfriend, former Olympic gymnast, Anne Fortify, they formed Barricade, the greatest protection agency in the Universe. Is this a Hell's Angel with amnesia or The Father of Time himself? The only thing this crusty old-timer does know is that he's got a gavel full of sand that foresees possible future disasters and a motorcycle that never needs gas to get him there just in time. 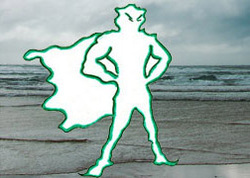 The reluctant hero want's to be left alone but he is finding that the more good he does for mankind the closer he comes to figuring out who he really is. "My flame will burn longer than injustice!" Scientist Cole Burns created a heating source that could burn forever and cost almost nothing. ​Heatco, a conglomerate heating company heard of his plan. They planned to steal the formula and control the heating industry. Rather than give up his life's work, Cole swallowed the only prototype. He became a living inferno, burning everything in sight. 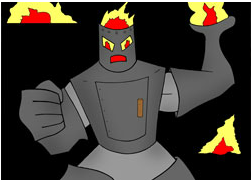 He encased himself in a steel shell and began a war on big business as, The Human Furnace. Chester Turner was the greatest safe-cracker the FBI ever had. That was until the day he opened a booby-trapped safe. A bomb went off in his face. Doctors were unable to separate man from safe, without killing him. So Chester became Comb-Man-Ation, a living, breathing and walking safe. 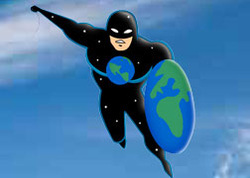 Taking advantage of his situation, he now he spans the globe protecting the valuables of the world's richest and elite. "Freshness is life's secret ingredient." 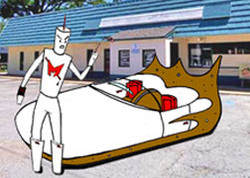 From a not-so-distant future where milkshakes have completely replaced the malt, comes Maltman! Chester Johnson is the great-grandson of the man who invented the malt. 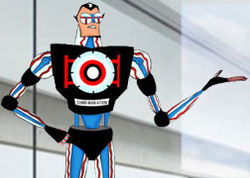 He created Maltman, half man, half machine. Using a a malt inspired time traveling auto-mobile, Chester sent his precious creation to the past, hoping to change the future of the malt and restore his family's important legacy. Eight year old Wes Williams lost his childhood when his house was hit by a drive by shooting. The incident left him an orphan. His prayers were answered late one night while he was visiting his parents gravestones. While there, an alien who was mourning a human grave close by gave the vengeful boy a blaster that disintegrates metal and the body of a twenty-five year old athlete. Now as Disarm, he is on a crusade to rid the world of man's deadliest creation. 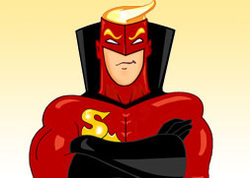 The heroes of HeroicWorld and all related characters are property of Scott Cranford and a copyright of HeroicWorld. All rights reserved.